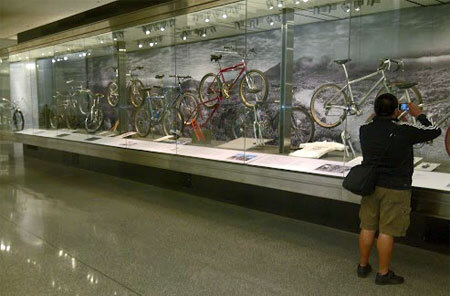 Mountain bike history is on display at the San Francisco Airport, international departure terminal. Worth a trip. SFO is more than an airport. It’s also a museum. 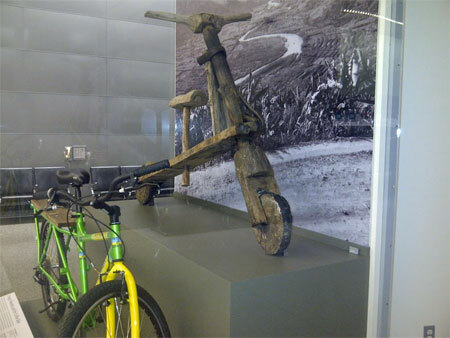 On display now is the history of the mountain bike, “From Repack to Rwanda.” What better place? Our international airport hard by San Francisco Bay is overlooked by Mount Tamalpais where the mountain bike sprouted wings in the 1970s and soared into a thriving industry by the early 1980s. Three display cases house a wealth of mountain bike history from the balloon-tire Schwinns of the early 1940s to the audaciously futuristic Fisher Superfly. We follow the growth of the sport chronologically through words, pictures, maps, even video. Most is familiar to anyone who has been part of the mountain bike movement. But there are surprises. I learned about one Erik Koski whose work on dropouts and forks (the now familiar U-shaped lugless design) blazed a trail to the modern bike with a better, more reliable ride. His innovations earned him a place in the Mountain Bike Hall of Fame, 1989. All the more satisfying is the Project Rwanda display contrasting the modern and oh-so-primitive wooden mountain “bike.” We see Tom Ritchey surrounded by children who may one day be elite bike racers or successful farmers helped by the modern mountain bike. Adrien Niyonshuti raced for his country in the London Olympics. He survived the country’s ethnic cleansing in 1994, but lost six brothers. Joe Breeze is credited with helping gather information for the display. Smart move. Joe’s early mountain bike frames deserve their reputation for workmanship and it’s only fitting that one of them would be on display in the Smithsonian. While the mountain bike can’t lay claim to being the first at anything (lest we forget cyclo-cross and those early “steeplechase” off-road races at the turn of the century) it changed the game and made cycling off-road something for everyone. More photos. Project Rwanda receives some well-deserved publicity at SFO. This entry was posted on August 23, 2012 at 7:33 pm and is filed under History. You can follow any responses to this entry through the RSS 2.0 feed. You can leave a response, or trackback from your own site. Thanks for posting this. I stopped by the exhibit on the way home from a work trip and really enjoyed it, but I wouldn’t have known about it without your post. Highly recommended for anyone who’s at SFO with a few minutes to spare. The red on hanging high is a Lawwill-Knight Pro Cruiser, the first production mtn bke framesets made. I own #81B287 of about 600 made between ’78 and ’82.